Advice on buying and maintaining a clarsach. A basic guide to Musical Notation. Instruction on sitting at the harp, arm, hand and finger positions. Lessons and exercises for two, three and four fingers. 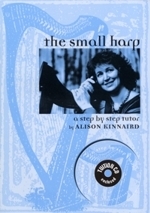 Chords, scales, arpeggios and moving around the harp. A section on ornamentation in the traditional style, with exercises on simple to advanced grace-note techniques.  40 tunes, varying from elementary to advanced. Historical notes and information on the tunes. The accompanying CD demonstrates the lessons in the book.